The Assam Government has accepted a proposal to open science stream in 50 colleges in several districts across the State. In Karbi Anglong district, science stream will be started in Eastern Karbi Anglong College and Thongnokbe College. The colleges and districts in which science stream would be newly introduce are BB Kishan College (Baksa), Bapujee College, BHB College, North Kamrup College and GLC College, all in Barpeta district; Behali Degree College, Kalabari College, both in Biswanath district; Manikpur Anchalik College in Bongaigaon district; Janata College and Madhab Ch. Das College in Cachar district; Basugaon College and Bengtol College in Chirang district; Borhat BPB Memorial College in Charaideo district; Murkongselek College, Maridhai College and Silapathar College in Dhemaji district. 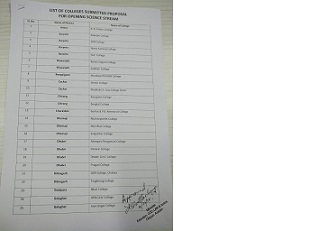 The other colleges where science stream would be introced include Alamganj Rangamati College, Chilarai College, Dhubri Girls’ College and Pragati College in Dhubri district; DDR College and Tingkhong College in Dibrugarh district; Bikali College in Goalpara district; HPB Girls College and Joya Gogoi College in Golaghat district; SK Roy College in Hailakandi district; Hojai Girls College in Hojai district; Sarbodaya College in Jorhat, SB Deorah College and DK Girls College in Kamrup (M). 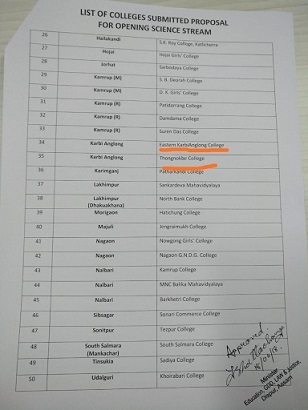 The other colleges, which are fortunate enough to get science stream, are Patidarrang College, Suren Das College and Damdama College in Kamrup (R); Eastern Karbi Anglong College and Thongnokbe College in Karbi Anglong district; Patharkandi College in Karimganj; Sankardeva Mahavidyalaya and North Bank College in Lakhimpur district; Hatichung College in Morigaon; Jengraimukh College in Majuli district; Nowgong Girls’ College and Nagaon GNDG College in Nagaon district; Kamrup College, MNC Balika Mahavidyalaya and Barkhetri College in Nalbari district; Sonari Commerce College in Sivasagar district; Tezpur College in Sonitpur district; South Salmara College in South Salmara district; Sadiya College in Tinsukia district and Khoirabari College in Udalguri district.